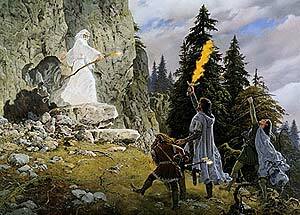 Discover the hidden influence of the renowned Canadian Tolkien illustrator Ted Nasmith in Peter Jackson's Lord of the Rings films! 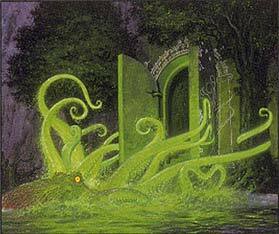 This web page is in no way affiliated with Ted Nasmith, nor endorsed by him in any way. I'm just a fan who is simply posting some comments and criticism about things that look remarkably similar to my admittedly amateur and completely untrained eye. 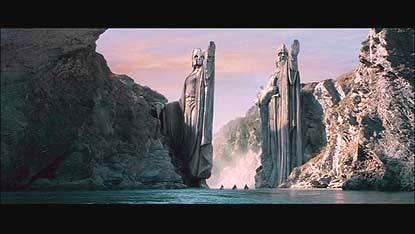 Even though Ted did not take the job, it seems clear that his established base of Tolkien artwork was used as a basis for some of the visual design of the film. 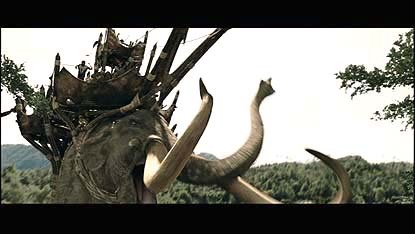 Below, I will present some examples of Ted Nasmith's artwork, side by side with stills from Peter Jackson's films (with chapter references from the Special Extended Edition DVDs) in just the straight chronological order. This is by no means a complete reference to all similarities; just the ones that particularly leapt out at me. When looking at these, keep in mind that we're not looking for an exact representation of the painting copied onto film: we're looking for influence. 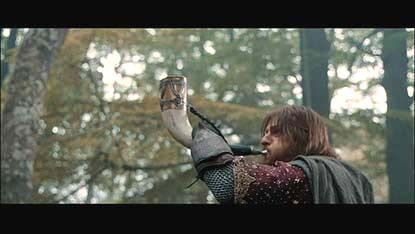 Any film concept artist will tell you that their work is just a starting point — sculptors, set decorators, and all kinds of artists are between their initial concept art and the final product seen on screen. 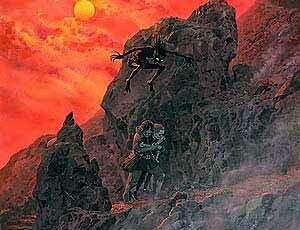 A Song in the Trollshaws (detail) by Ted Nasmith and DVD Ch. 21, The Flight to the Ford. 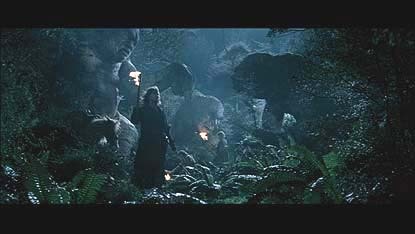 Jackson's used this setting at a different moment in the story, but what strikes me is the positioning of the trolls, frozen in stone, in the background. 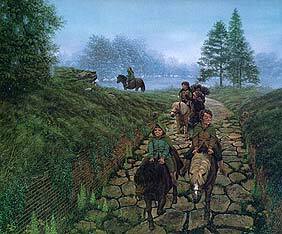 Riders at the Ford by Ted Nasmith and DVD Ch. 21, The Flight to the Ford. The visual set-up of this entire scene — Jackson's story changes notwithstanding — is identical. 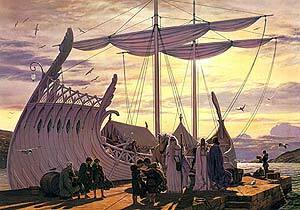 To my knowledge, neither John Howe nor Alan Lee ever painted it quite this way. 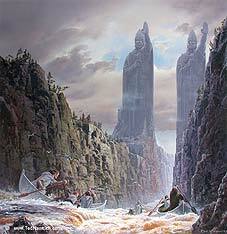 At the Ford by Ted Nasmith and DVD Ch. 21, The Flight to the Ford. 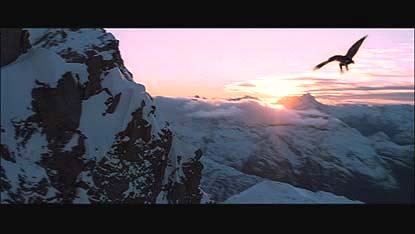 (Hard to get a good still shot of this action sequence). 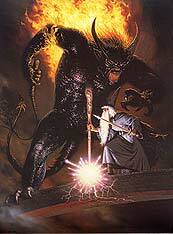 Gandalf Escapes upon Gwaihir by Ted Nasmith and DVD Ch. 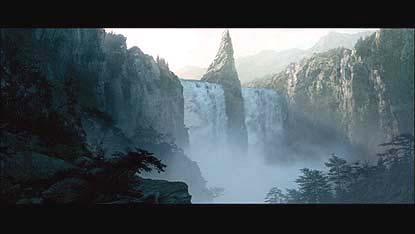 22, Rivendell. Jackson uses the exact same shot angle. 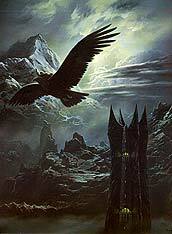 Where Ted has the moon obscured by Gwaihir, Jackson needs to have it obscured by the tower of Orthanc, since the eagle is moving. 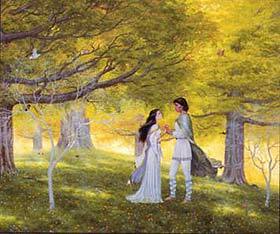 There's a definite relationship between this painting of Arwen and Aragorn Ted Nasmith did for the Middle-earth Collectible Card Game, and this still from DVD Ch. 26, The Evenstar. All they've done is added a bridge and darkened everything. 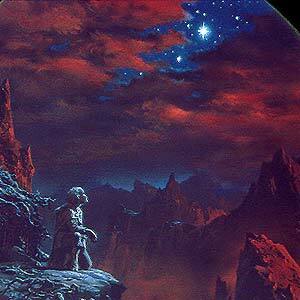 Password into Moria by Ted Nasmith and DVD Ch. 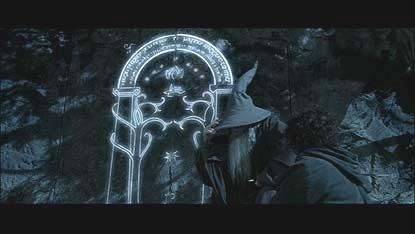 33, Moria. 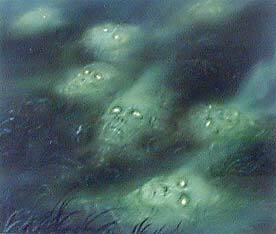 Everyone mopes around in the same places as in Ted's painting. 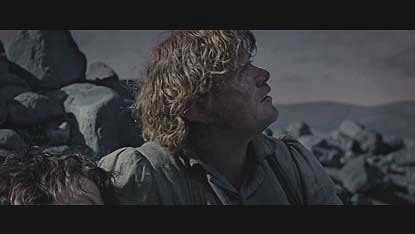 The scene in DVD Ch. 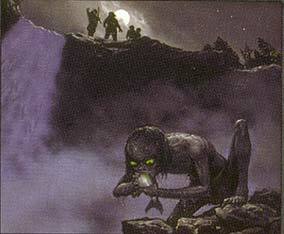 33, Moria, is identical to this painting of the watcher in the water that Ted Nasmith did for the Middle-earth Collectible Card Game. 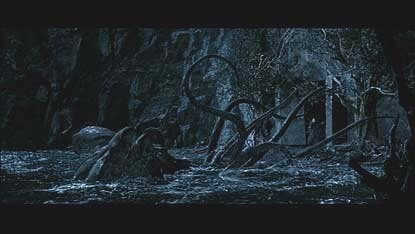 Look at the shot angle, and the way the upper left tentacle is curling; it's the spitting image. 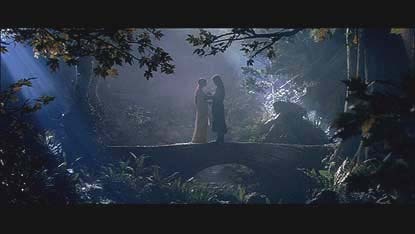 At the Bridge by Ted Nasmith and DVD Ch. 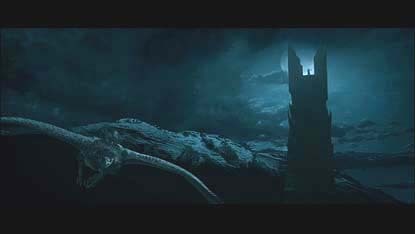 36, The Bridge of Khazad-dûm. Interesting similarity in the angle of the shot. 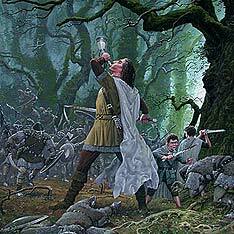 Boromir's Last Stand by Ted Nasmith and DVD Ch. 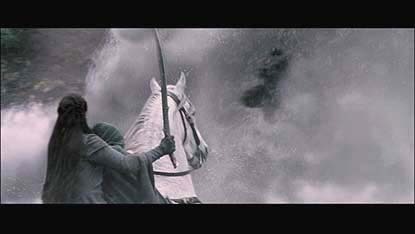 44, The Breaking of the Fellowship. It's hard to get a good still of all of this scene, but there's a definite relationship -- the shots are at similar angles, and everyone's positioned in the same places. 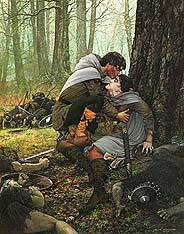 The Last Words of Boromir by Ted Nasmith and DVD Ch. 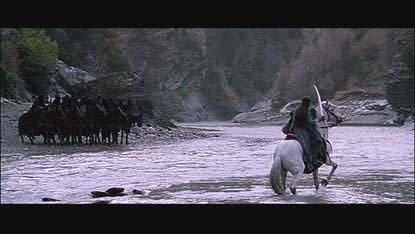 45, The Departure of Boromir. 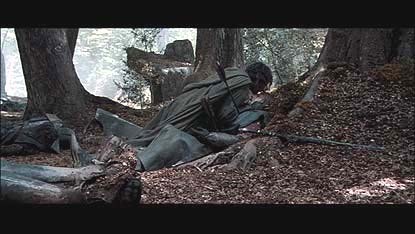 Hard to get a good still shot, but there's a lot of remarkable similarities; the angle of the shot, leaning back against a tree trunk — right down to the position of the arrow. 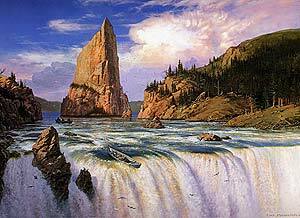 At the Falls by Ted Nasmith and DVD Ch. 46, The Road Goes Ever On... I think both shots are aiming for a similar sort of feel. 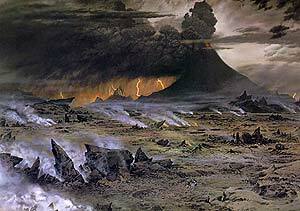 An painting by Ted Nasmith for the Middle-earth Collectible Card Game, and DVD Ch. 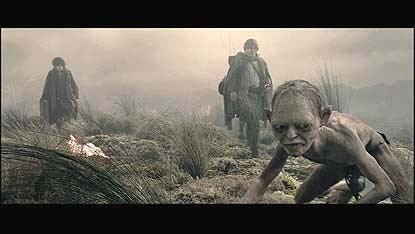 3, The Taming of Sméagol. 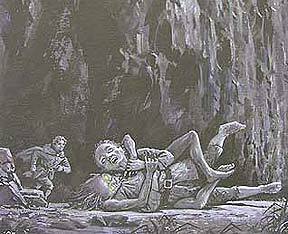 Note the positioning of the combatants; both have Sam grasping Gollum's right hand, and Gollum's legs wrapped around Sam's waist. 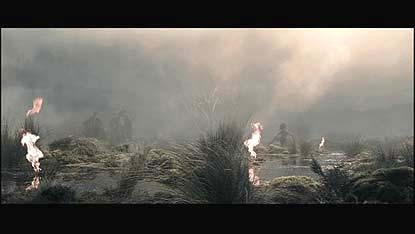 Through the Marshes by Ted Nasmith and DVD Ch. 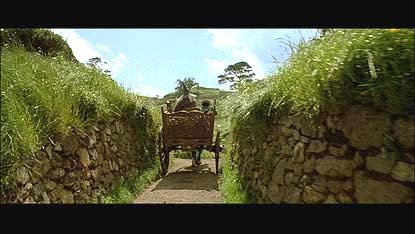 14, The Passage of the Marshes. 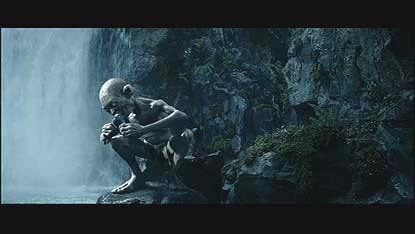 This mist is concealing a lot in this still, but if you watch the entire scene on film you'll see the similarities throughout, down to Gollum's gesturing and reflection in the water. 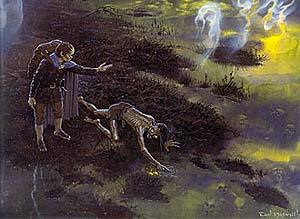 Apparitions (detail) by Ted Nasmith and DVD Ch. 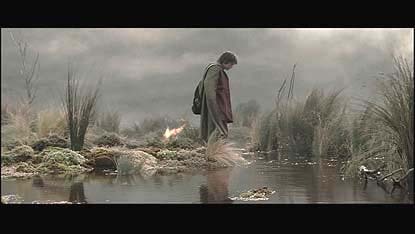 14, The Passage of the Marshes. 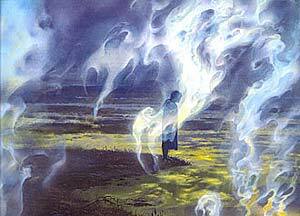 Apparitions (detail) by Ted Nasmith and DVD Ch. 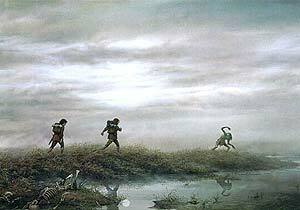 14, The Passage of the Marshes. 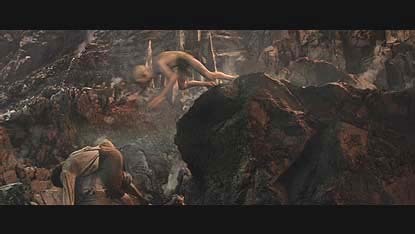 Another place where it is hard to capture a still, but if you watch the scene, it's set up quite like Ted's painting, as Gollum talks to Sam and Frodo wandering in background. 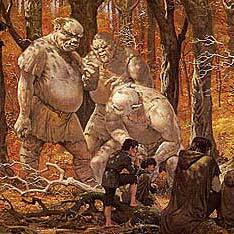 The Stranger in the Forest by Ted Nasmith and DVD Ch. 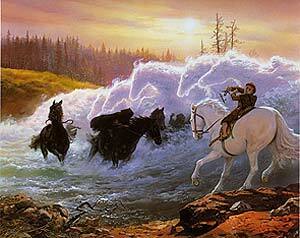 15, The White Rider. Just noting the angle of the shot. 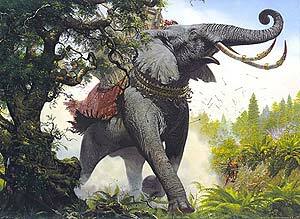 The Mumak of Harad by Ted Nasmith and DVD Ch. 30, Of Herbs and Stewed Rabbit. 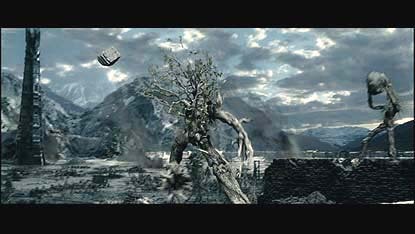 The Wrath of the Ents by Ted Nasmith and DVD Ch. 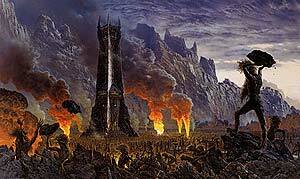 59, The Flooding of Isengard. 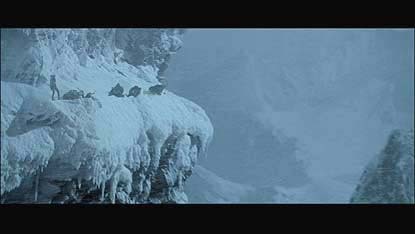 According to the commentary, this scene is a last-minute addition to the film; another scene I've never seen depicted by Alan Lee or John Howe... I guess they just had Ted. 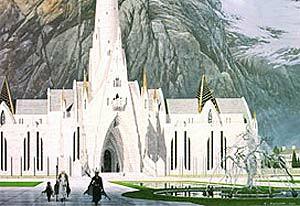 In Haste to the White City by Ted Nasmith and DVD Ch. 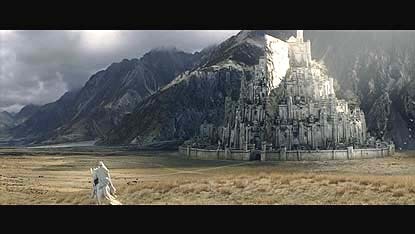 11, Minas Tirith. 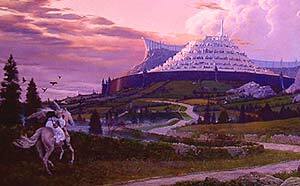 Ted has a couple of paintings which depict Gandalf approaching Minas Tirith in this way, which I haven't seen John Howe or Alan Lee do. 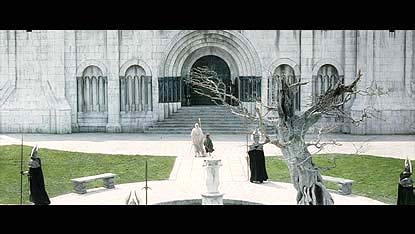 At the Court of the Fountain by Ted Nasmith and DVD Ch. 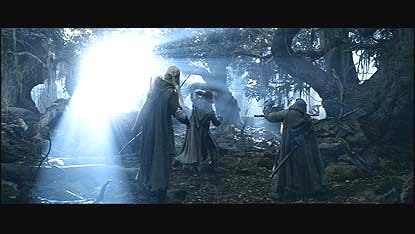 12, The Decline of Gondor. Much similarity in shot angle, tree on right, folks passing on left in scenes. 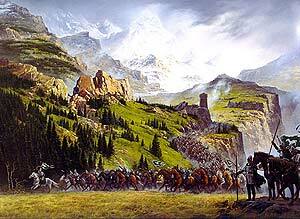 The Riders of Rohan by Ted Nasmith and DVD Ch. 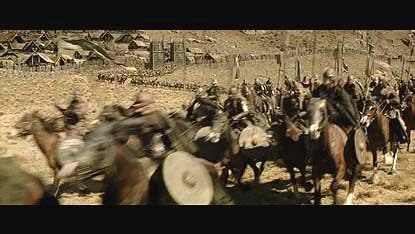 20, Theoden's Decision. 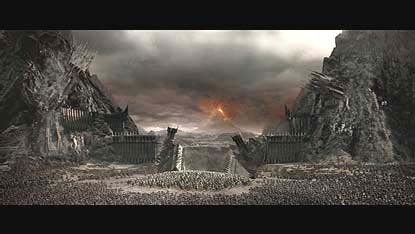 It's just interesting how the army descends from the structure on the hill in the same snake-like progression. 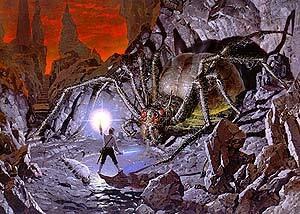 Shelob's Retreat by Ted Nasmith and DVD Ch. 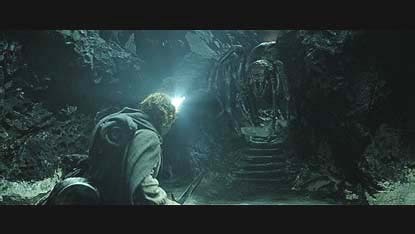 43, The Choices of Master Samwise. 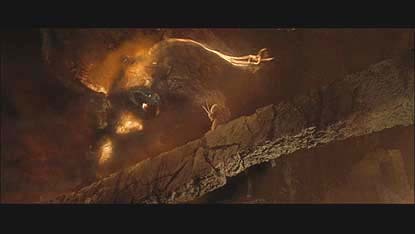 Definitely not a John Howe spider, and regardless of the talk about "Tunnel Spiders," Shelob on-screen looks far closer to Ted's version than any other I've seen. 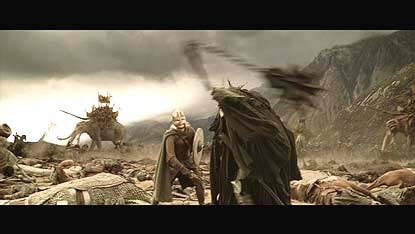 Eowyn and the Lord of the Nazgul by Ted Nasmith and DVD Ch. 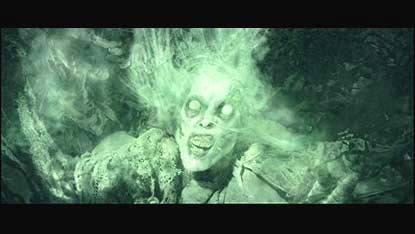 52, Shieldmaiden of Rohan. The shot angle and positioning of the actors in these scenes is identical. 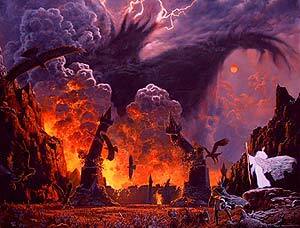 Across Gorgoroth by Ted Nasmith and DVD Ch. 63, The Land of Shadow. 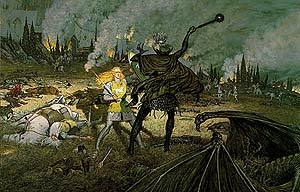 I've never seen John Howe or Alan Lee depict this as realistically as Ted. 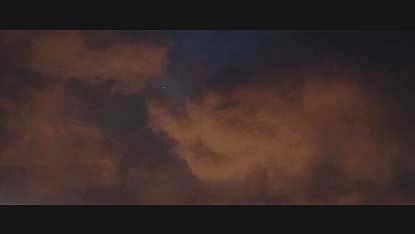 In the actual moving shot you'll also see the smoke rising and the lightning north of the mountain. 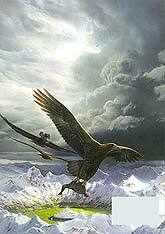 Endgame on the Mountain by Ted Nasmith and DVD Ch. 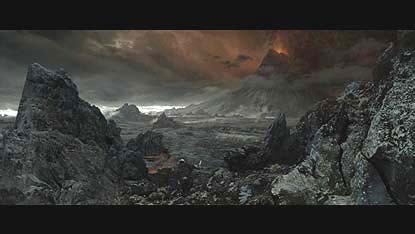 68, Mount Doom. 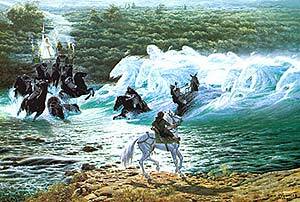 Departure at the Grey Havens by Ted Nasmith and DVD Ch. 76, The Grey Havens. Same shot angle and general feel, and a fairly similar boat design seen in the rails and general shape and size. 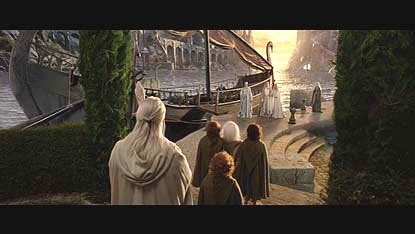 Closing thoughts: Whether or not you think the above similarities are "just coincidence," it seems to me that if New Line ever makes The Hobbit, I think they owe it to Ted Nasmith to re-extend the offer of work they made in 1999, so that this important Tolkien illustrator can get some of the fame and credit he rightly deserves for his years of service to Tolkien fans! and in low resolution exclusively for the non-profit educational purposes of criticism, comment and scholarly research.